Blackhat, Miami Vice and Public Enemies form something of a loose thematic trilogy: all position an aloof, contemplative loner-hero against a vast technological system governed by the movements of abstract finance and information, of which the film’s antagonists are only agents. Mann’s Dillinger (Johnny Depp) is an old-school, romantic vigilante who longs to live in the shadows and cultivate an aura of mystique, but is weeded out by the all-pervasive technological systems of his hunters that unceremoniously treat him like a glitch to be removed; Crockett (Colin Farrell) is merely a cog within the network, his every movement furthers its self-perpetuation yet he’s unsure of how it operates as a whole; Hathaway (Chris Hemsworth) has a great deal of knowledge about and thus a significant degree of control within the system. However, he’s unable to transcend or escape it, only to momentarily manipulate it to serve his own ends, and, as an independent hacker, untied to any wider group of affiliates (and, in Blackhat, the criminals and the FBI are simply mirror images of one another, one organisation using computer code to gain profit, and the other utilising it to gain information; both are willing to casually turn against one of their own as soon as they appear to be an obstacle to this overarching goal), his power is greatly circumscribed. 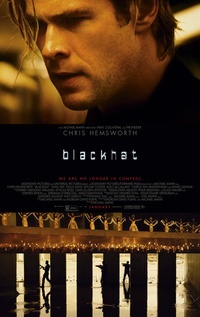 It’s the tension between immaterial data and its material applications that’s the main subject of Blackhat, which sets up a world in which every concrete environment is connected via a vast network of electronic signals and these signals can be easily manipulated by those with the know-how to create huge tangible effects. Crimes can therefore be committed at a fundamental remove from the physical and (due to the huge temporal compression allowed by these data channels) from an extreme distance. Hathaway - a brilliant coder who is temporarily released from jail following a cyber-terrorist attack on a nuclear power plant - spends the vast majority of the film hunting down an enemy that remains entirely invisible to him. Every human movement is tracked and stored by an omnipresent surveillance state, and the patterns of data can then be accessed (either officially or not so much) and analysed. To complicate things further, the code that was used to destroy the plant is a modified version of one written by Hathaway several years ago - not only does privacy erode in this environment, so does authorship. It’s established early on that a willingness to be flexible in regards to morality and external identity is a necessity in order to survive within this landscape, but the issue that the film will go on to interrogate is how does an individual also hold onto a stable sense of selfhood? Mann has always had an interest in archetypes, and here he intentionally strips his somewhat cliché characters of specificity in order to transform them - through the sheer vigour of his filmmaking and commitment to a consistent tone of existential solemnity - into mythic figures. Traditional dramatic beats are eschewed in favour of a montage-like approach to narrative construction, piecing together a compressed, fragmented series of emotionally charged gestures, glances and sensations. High-definition, agile, handheld cinematography is typically associated with documentary immediacy, but Mann’s preference for complex in-camera abstractions, abrasive soundscapes, spatial vagueness, and painterly neon-etched colour schemes counteracts any sense of simple realism. Blackhat has received a largely hostile reception amongst both audiences and critics, which is understandable, considering that it’s the most formally radical film of a career characterized by increasingly eccentric combinations of art-house experimentation and mainstream genre storytelling. It may sound like an odd comparison, but it reminded me a little of late Godard: like Godard, Mann tends to organise compositions around the stiff, grid-like forms of hyper-modern, post-humanist landscapes, only to focus his attention on the striking pictorial abstractions that exist within these forms - an aesthetic act which is treated as a form of resistance in itself. This review was published on February 25, 2015.